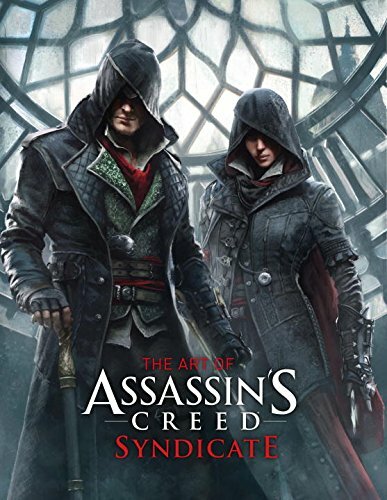 This is yet another wonderful companion artbook for the Assassin's Creed Series. This time you get to look at Victorian London during the Industrial Revolution. Famous places and buildings are re-imagined, such as the Big Ben, Buckingham Palace, Trafalgar Square, Tower of London, Westminster, The Thames, Southwark, Whitechapel and more. Gamers who live in London should be thrilled to see those familiar sights as interpreted by artists. I love the environment art of Assassin's Creed and the art direction is fantastic. It's definitely bleak, but it's also so hauntingly beautiful as well. In addition to the environment art, there are also lots of character designs of the new assassins, supporting characters and the everyday men and women on the streets. It's pretty cool as usual to see the character and costume designs. Generally speaking, most of the illustrations are really detailed. The photo-bashing style is done extremely well. Photos are used for their textures to overlay onto the digitally drawn art and it works really well. At times I don't even get the feeling of the photo and digital art collage. I love the way they are painted in nitty-gritty style too. There are also commentary that talk about the design. It's a great artbook. Highly recommended. Do check out other Assassin's Creed artbooks if you haven't.